It’s been a while, hasn’t it, guys? And I’m very pleased to say the website troubles have finally been cured, and we’re back, stronger and faster than ever. If you’ve been following me for a while, you’ve unfortunately witnessed the absurd technical issues I’ve had to endure for the past few months regarding the stability of the site. Let me tell you – that’s not even the half of it. Between it going offline intermittently and generally being laggy, I was having an issue where the whole site would crash for 15-30 minutes every single time I went to publish an article before finally coming back online. It’s been a constant back-and-forth with tech support, and I’ll be honest; it took a toll on me. 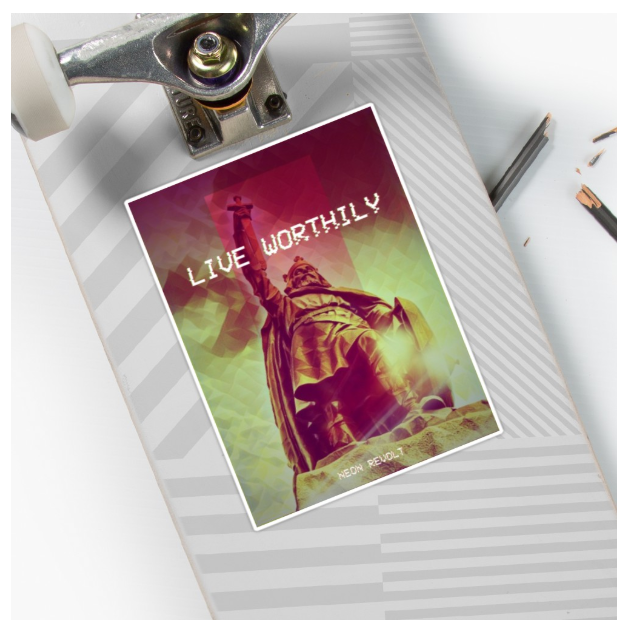 It’s something of a truism that we take things for granted when they work. It couldn’t be more true in this case. Some of it was bot-related. Some of it was server configuration related. Some of it was due to the technical incompetence of a support team that butchered a site migration. And some of it was due to a “natural” DDOS when @Education4libs promoted my introductory article on #QAnon to his over 350,000 followers. Yeah, that happened! It wasn’t just huge for me – but it was huge for someone with his size following as well. Think about being able to redpill well over a quarter-of-a-million people with just a few tweets! That took guts! And while I’m extremely grateful for the promotion, I really wish I had been better prepared, from a technical standpoint. Don’t get me wrong; I was trying the whole time, but I can’t allow that kind of thing to happen again. 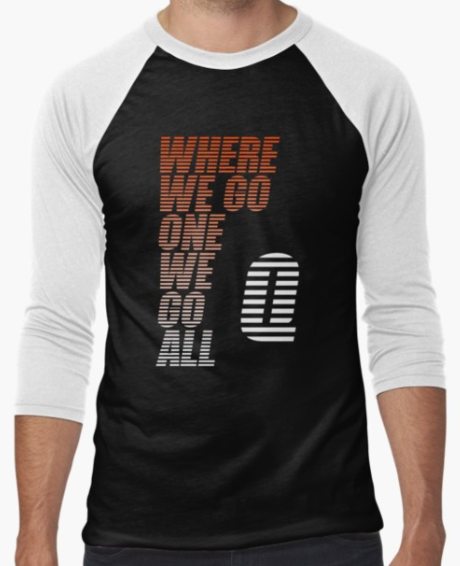 Q is only going to get bigger, and more people are only going to come looking for information. So site stability and accessibility is a top priority for me. Thankfully, my new host is great. They not only fixed the damage the old host has did, but they hooked me up with extra caching, and cloudflare support – so the site should be running better than ever before – which means I’ll be able to write better than ever before, because now, I just won’t have to deal with the same kind of technical headaches I was dealing with. Super grateful for that. 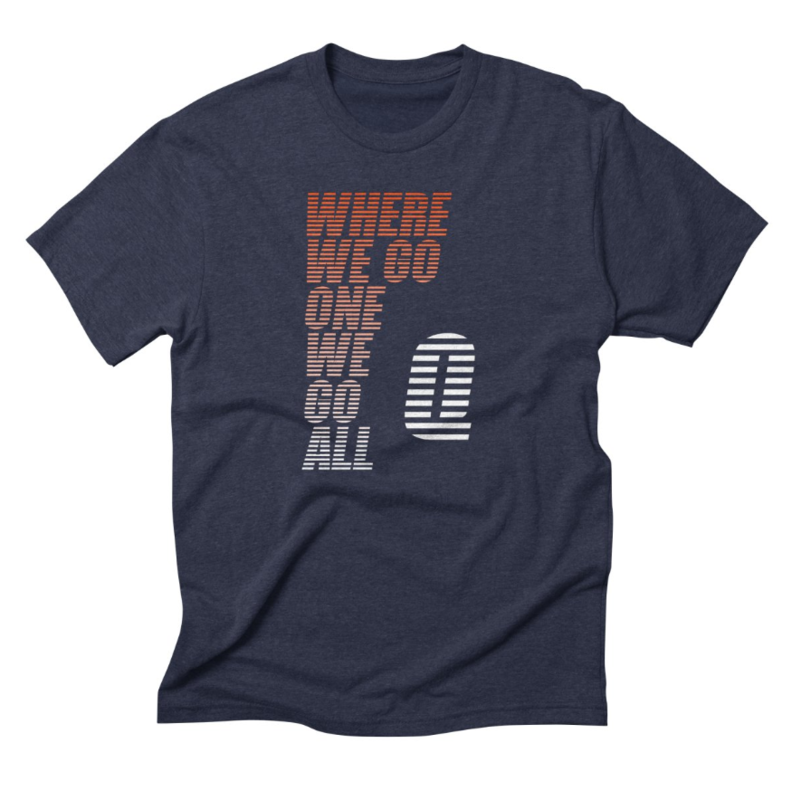 As for QAnon, well… we’ve all been feeling his absence pretty keenly, I imagine. 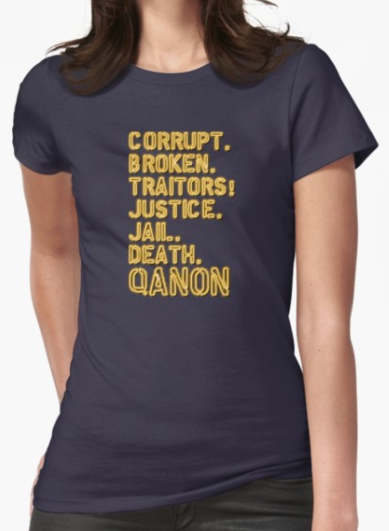 We’re now officially in the single longest span of time without Qdrops since Q started posting. His last post was on July 4th, and he’s been gone so long now, some are starting to wonder… is he ever coming back? Friends, there will come a day when Q stops posting. He’s not going to be here forever. We’re going to have to accept that at some point. But major things are still happening, and I’m going to explain why I don’t think we’ve seen the last of Q just yet. I’m going to start by directing your attention to this post I put up on Gab two days ago, just because I have a lot of readers who might have missed it because they themselves are not on Gab yet. #QAnon has been silent for some time now. This is, in fact, the longest he’s ever been silent. This is (probably) intentional, and not the result of platform interference, or his comms being cut, or whatever other theories are flying around right now. That doesn’t just happen. That was intentional. Someone deliberately turned off the lights. They turned them back on, and Trump cracked a joke about it as cover. Now refer to the images below. The blackout date is 7/17. Mirror that and you get dates that line up on . In this case, 12/19, 2/17,4/18, and 6/17. 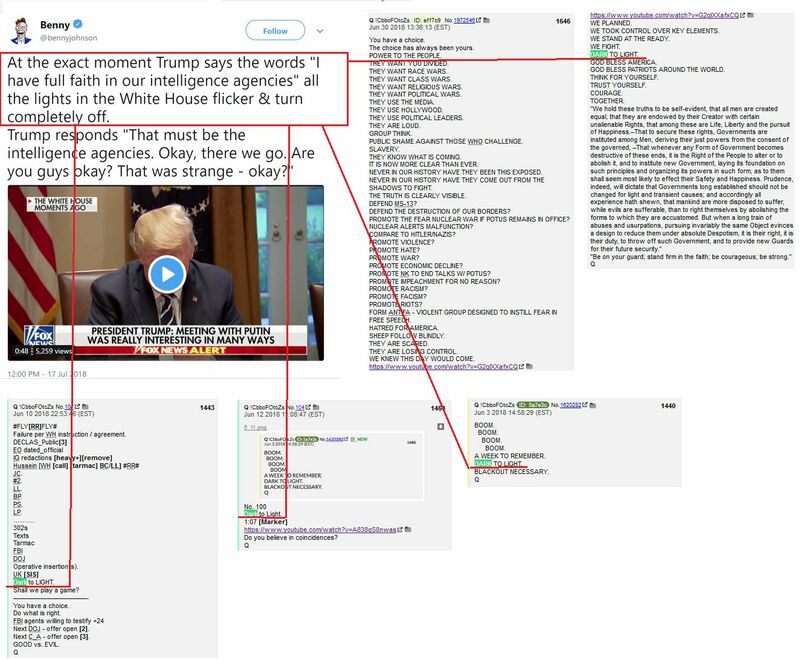 Going back through the Qdrops, on 6/17, Q talks about a  day delta. Go back to  on the clock. That leads to 4 dates, one of which is 6/12. 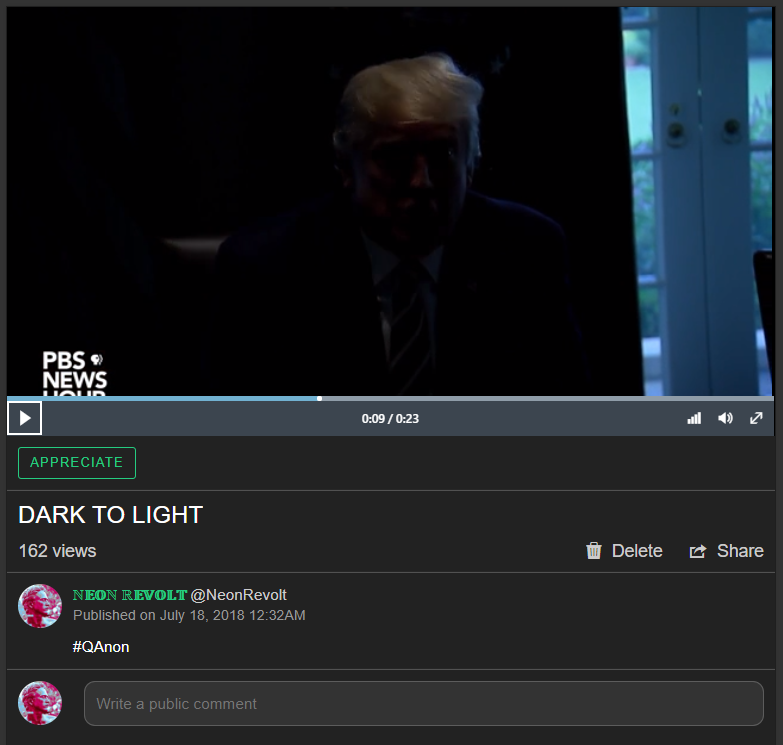 Third image shows all the related “Dark to Light” posts. Glean what you can from them. We all know this was a historic week; what with Trump meeting with Putin, and everything going on. I don’t find it surprising at all that Q has been silent during this time, considering how hard they’ve been fighting to keep these two apart. Remember, they wanted US to kill each other; not have us unify against #TheCabal. That failed, once and for all. I wouldn’t be surprised, given the way #FakeNews has been shrieking “TREASON! TREASON! TREASON!” for the past 48 hours. Did you see that “interview” Wolf Blitzer did with Rand Paul? He wouldn’t even let him speak, he was so panicked and desperate to get his “treason” narrative across. I bet Wolfie’s gutropes went all cold and squelchy when he heard that. I bet Jim Acosta cried himself to sleep in his diary that night. I bet Don squeezed out a few lemon-shaped-turds of his own – because they were all in total panic mode. I don’t think this is the last we’ll hear from Q. (I certainly hope not. He’s got a lot of redpilling left to do, if you ask me). No, I think he’s just really preoccupied with everything happening right now, and I can’t blame him! As for Dark to Light, no doubt it’s a marker. But it’s meaning? I think it’s clear that it’s a kind of “Go” signal. It’s time to begin bringing those who have hidden their deeds in darkness, into the light of truth. And #POTUS just made sure the world saw it on national TV. 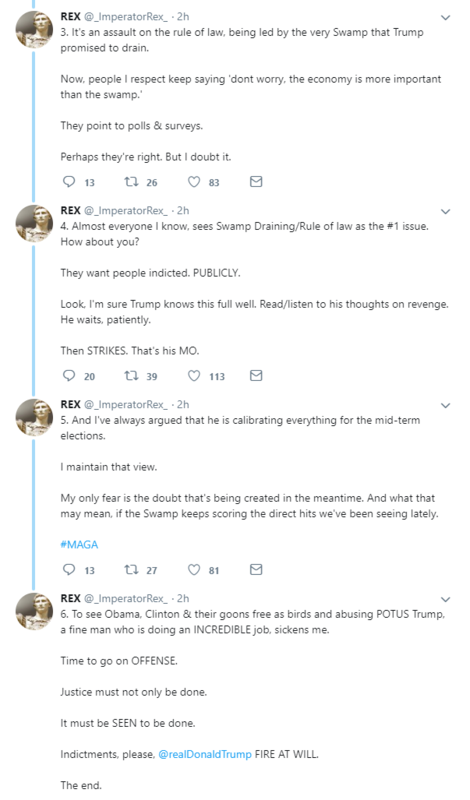 I think ImperatorRex sort of picked up on this instinctively – just by noting the timeline that lays ahead of us with midterms and such (although in this context, he was addressing the Podesta/Mueller Immunity deal). 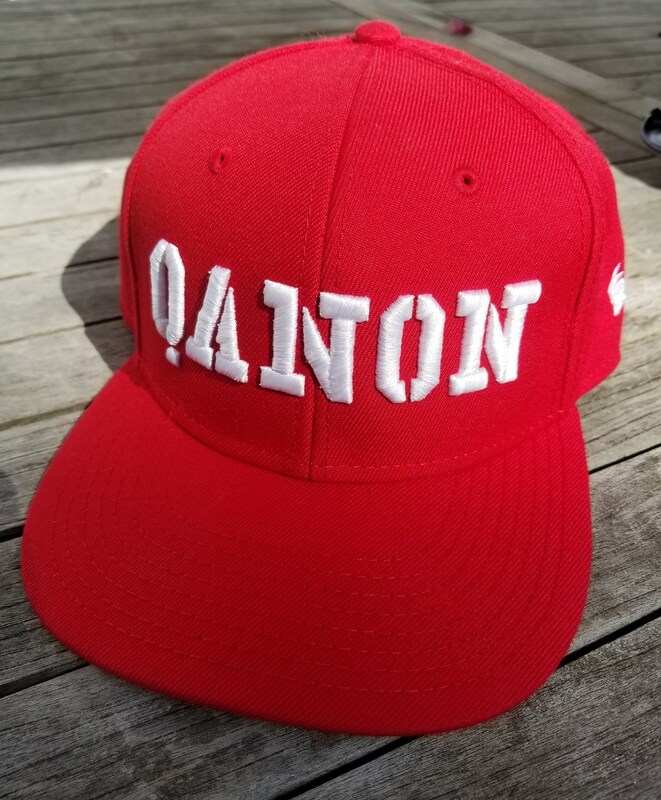 Now… while I am hesitant to make any predictions on when Q is going to return… Sunday the 22nd would be 17 days since he last contacted us. 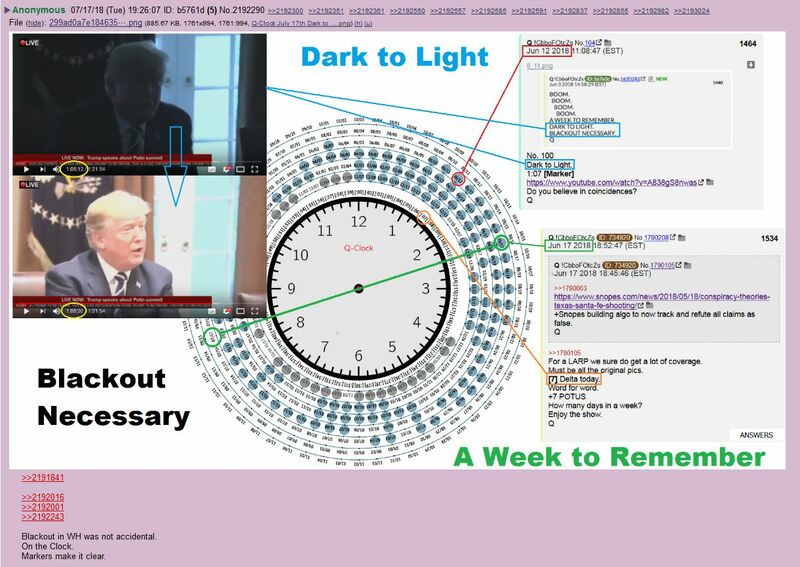 And Q does have a habit of posting on Sundays (if for no other reason than to set the narrative for the week). So… while I’m not going to call it with any degree of certainty… I will say I won’t be surprised in the least if Q makes a sudden reappearance this Sunday. Enjoy the weekend, folks. Spend some time in the sun, outside, with your family, and with plenty of good food. Recharge, because I think we’re going to be getting right back into things in short order. Some of you may believe Q is gone for good. Read this. It makes no difference if Q continues posting or not. 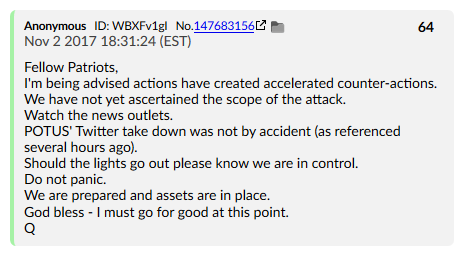 Q has done their job. It is time for us to pick up the mantle and continue spreading the truth. We may lose friends, family, or associates. This does not change the fact that we are in the fight of our lives. Just because there is no “front” to march towards to fight does not mean the fight is not real. This is a different type of warfare that almost no one of the “normies” have experience with. This is why we are here. We are digital green berets behind enemy lines teaching and building a following to fight back when the the time is right. We must have patience and continue pushing to educate those who are put in our path. People need to stand for something or they will fall for anything. Let us bring them into our ranks with patience, kindness, forgiveness and understanding. Waking up for some will be hard and unfortunately for some who never wake it will be the end of them. We must put aside party lines, our past grievances, our bias, and our feelings of being superior. We are all in this boat together so if we fail we ALL go down. None of us are superior in this respect. Be kind, have patience, and get educated. The more factual knowledge you have the better the chance you have to wake up someone if you are patient enough. Plant the seed of doubt for that person, no matter how small. Then water regularly with information and compassion. 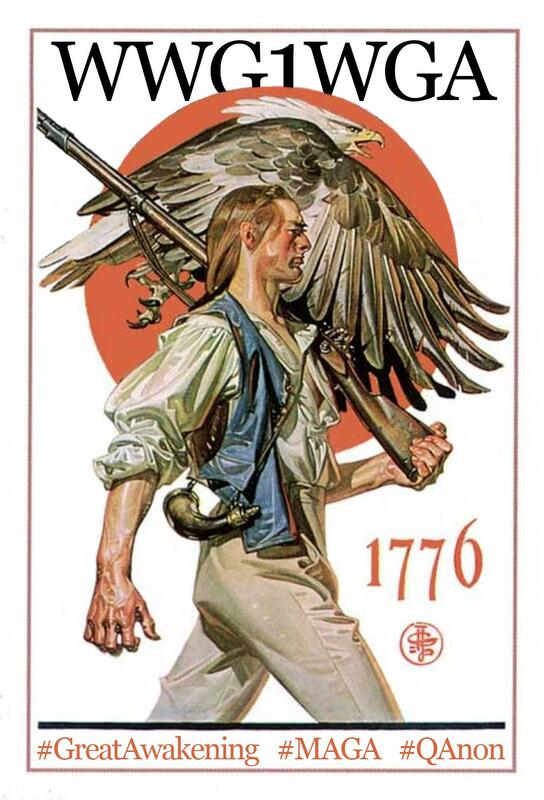 WE THE PEOPLE must stand together as one or we will fall. We will never get another chance. The DS will never relax again if we screw this up. The DS will take steps to ensure we can’t organize ever again. Mass censorship of the internet, mass surveillance, and door to door interrogations. Pray for us all to have the strength, wisdom, compassion, patience and resolve to weather the coming storm. I woke up this morning and I heard in my spirit, “disinformation is real, disinformation is necessary.” I believe it was the Holy Spirit speaking to me. I had the immediate knowing that the Podesta Brother immunity was part of the disinformation. 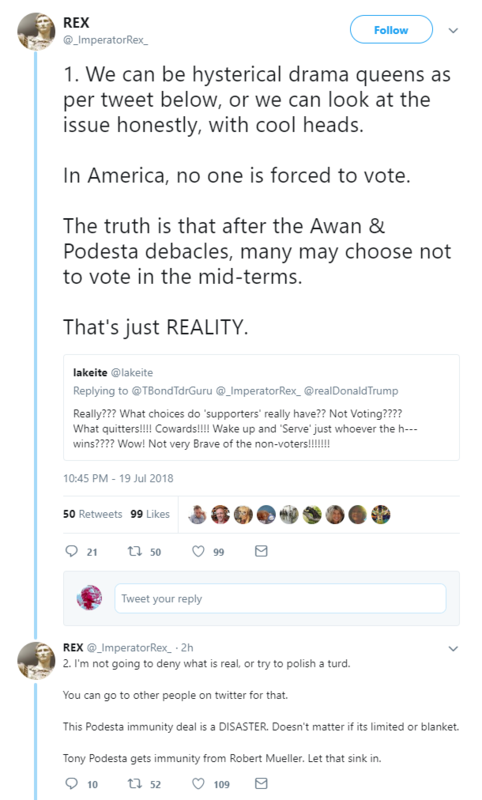 Because who stands to lose if the Podesta Brothers start to squeal? Lets see who starts to freak out. (besides conservatives) Since Q has been quiet the media and politicians have lost their minds, have you noticed? July 22nd, sealed indictments numbers will be updated. Look for an acceleration in the number per month. You confused me, cause Sunday is the 22nd and Saturday is the 21st. Either way I hope Q is back soon. Glad to hear that your tech difficulties are resolved in time for future Q drops. Just a typo. I fixed it. This is my 2nd attempt to post a reply. Weird. I had a lot of trouble with replies yesterday.. kept asking for a valid url.. which I had typed in. I finally today copied the URL off the address bar and it worked. Another great post, Neon. I too think Q has more to share. The battle has begun in earnest and a good leader stays close to his troops during the battle. It’s one of the things that make them great. My brain has been getting nudged by something Q posted several times in the past. So at the risk of looking dumb I’m going to share it here. Q has posted “4,10,20” on several occasions. The anons say it’s the numerical value of DJT. 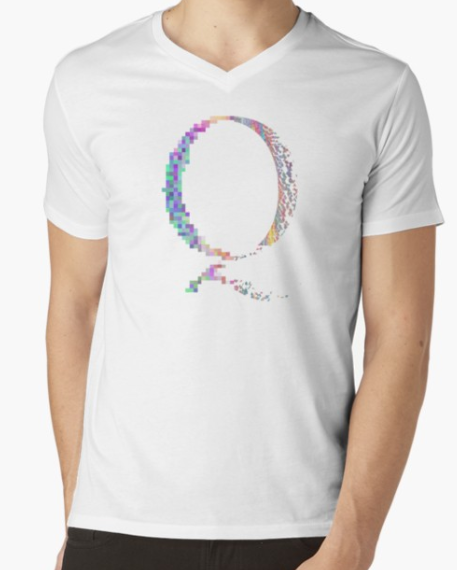 I accept that but Q’s Qlues often have double meanings. 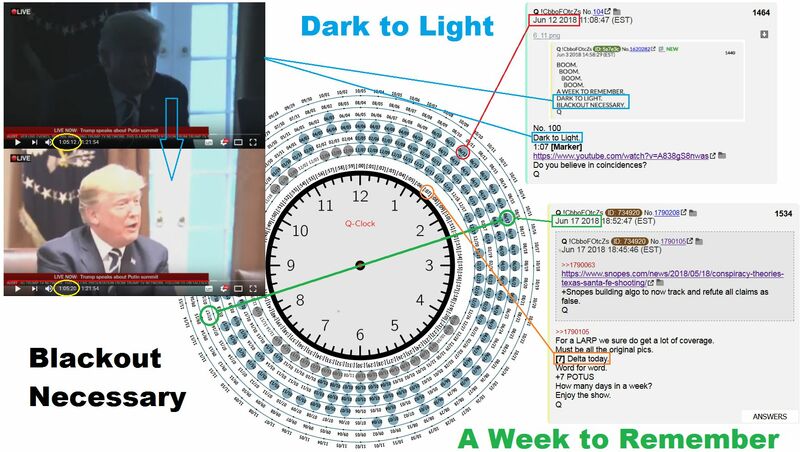 If you think back the first time Q went dark it was for 4 days, the next time was for 10 days…following that logic I think Q may stay dark for 20 days this time, which would be the 24th of July. Ok you can laugh, but please do it kindly. And again, thanks for a great article. Thanks to you and ALL Anons. Much love to all! As soon as I saw the video, I thought of ‘dark to light’ and ‘blackout necessary ‘. Perhaps there were presents left behind on White House systems? A power loss then reboot to install the good software? 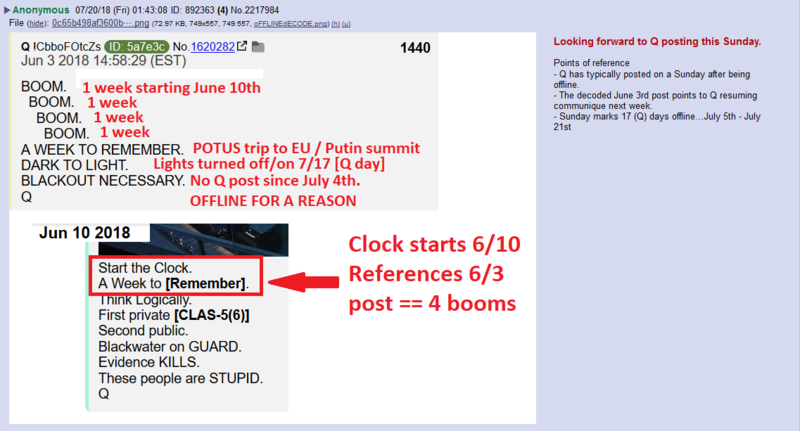 They knew about the malware some time before, which is why Q referenced this event months before, and you let it keep running so Cabal thinks they’re still getting the straight poop? Just spitballin’ from a non-techie here. I had a dream (3 times in one night) which said very clearly. 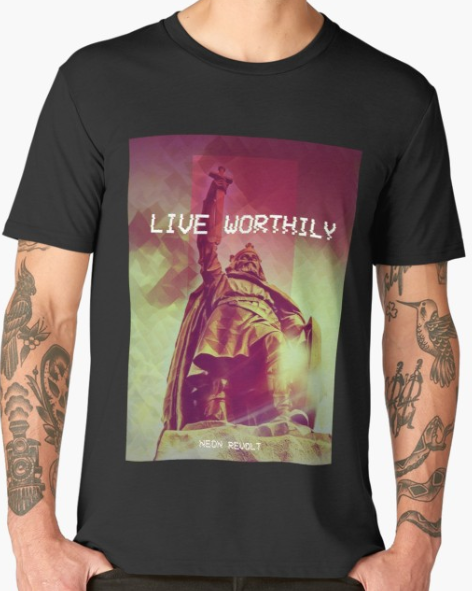 July 29th… BOOM. Any of you singularities have any thoughts? I thought immediately of the BOOM festival in Portugal. I sent you in Messenger a dig I worked on regarding a Child-trafficking op. We have had previous communication via messenger. Please get this to those who are better qualified diggers. Shoot I can’t find it at the moment and Im locked out of Twitter, but there was a post in Crazydaysandnights that a director of an important government agency slept with two underage girls and the girls sold the info to who they thought was a tabloid. Turned out it was a foreign country. Could that have been Russia and could the director have been Mueller or Comey? I also woke from a dream early in the morning on July 20. 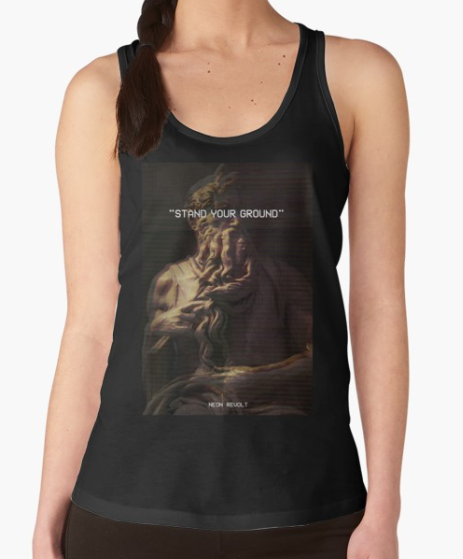 There were dark skies, black skies, in my dream, and the wind was really howling, indicating a storm was here. The message in my head was “Several people are going down behind the scenes. Know that it’s happening. It’s finally HAPPENING!” And I awoke to a feeling of happiness, not the fear that one would expect from such images. My mind projecting my hopes? Or my mind tapping into something? I guess we’ll see soon enough, but I’ve had “knowing” dreams twice previously before big national events. Although I didn’t associate what they meant till later, they both proved correct in the end. Just a thought: Neon is a beacon in the darkness. Take what is given and share it with the web. I post to Lionel Nation, with the hope that a “Normie” sees what is posted and is inspired to do a bit of research. 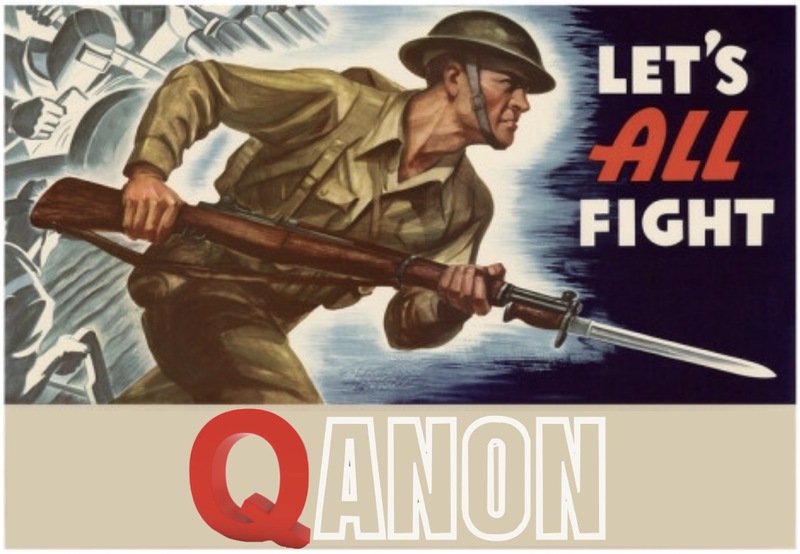 It is my sincere desire that “We the People” do what Q has inspired US_A to fight for ALL that is Good and JUST. Secret service agent Noel E. Remagen died of a stroke in Scotland while on duty with POTUS.. Any chance he would be Q ? Nice work, no one is laughing now. “””My brain has been getting nudged by something Q posted several times in the past. So at the risk of looking dumb I’m going to share it here.